Yesterday morning as I was watching Good Morning America while getting the girls ready for school, there was a story that immediately caught my attention. GMA was doing a feature story on stroke, and it profiled a 24 year old stroke victim, Bri Winkler who is also a meteorologist from Los Angeles. Strokes can happen to anyone at any age, even infants. 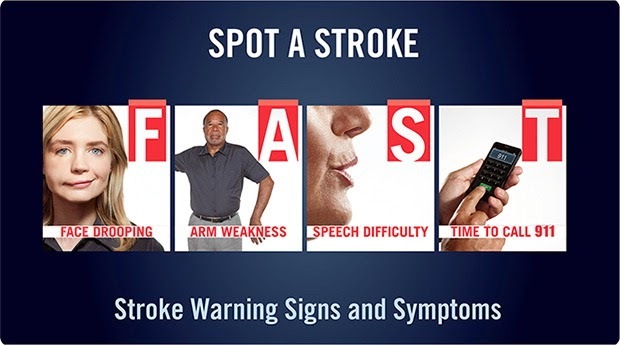 May is American Stroke Month and the American Heart Association and the American Stroke Association want you to know the signs of a stroke and how to get help in the event of a stroke. Stroke is the fourth leading cause of death and the leading preventable cause of adult disability in the US. Each year, about 795,000 Americans suffer a new or recurrent stroke, that equates to about one stroke every 40 seconds. What is a stroke? The American Stroke Association offers this definition: "A stroke occurs when a blood vessel that carries oxygen and nutrients to the brain is either blocked by a clot or bursts (or ruptures). When that happens, part of the brain cannot get the blood (and oxygen) it needs, so it and brain cells die." Although the symptoms vary from person to person and among age groups, there are some classic signs of a stroke that should not be ignored no matter your age or your overall picture of health. A simple way to remember the common signs is to memorize the acronym F.A.S.T. to help yourself identify the signs of a stroke. F - Face Drooping - Does one side of the face droop or is it numb? Ask the person to smile as a test. A - Arm Weakness - Is one arm weak or numb? Ask the person to raise both arms. Does one arm drift or fall downward? T - Time to call 9-1-1 - If the person shows any of these symptoms, even if the symptoms go away, call 9-1-1 and get them to the hospital immediately. Time is of the essence during a stroke. The longer the victim goes without treatment, the more likely it is that there will be brain damage. When you recognize a stroke and immediately call 9-1-1, the person has a greater chance of getting to an appropriate medical facility quickly in order to be assessed for treatment options, like a clot-busting drug and other medical devices. Know the warning signs of a stroke, and you'll be armed with information that may one day save a life. Download the F.A.S.T. app here. Watch this video and this video on the warning signs of stroke.